When I saw Chloe Kim’s now-famous “hangry” tweet hit the Internet, I wasn’t so much amazed that an Olympic athlete would tweet in the middle of competition — I was more stunned that on a ski hill she could tweet, obviously without any connectivity issues. In winning the snowboard halfpipe competition Kim became one of the new popular stars of the recent Winter Olympics in South Korea, backing up her shredding skills with an adept mastery of Twitter. But her simple ability to connect while at a somewhat remote mountainside location may have been another victory for one of the Olympics’ undersung heroes, the apparent gold-medal connectivity that was in place at just about every venue involved in the PyeongChang fortnight, according to an on-the-scene witness. 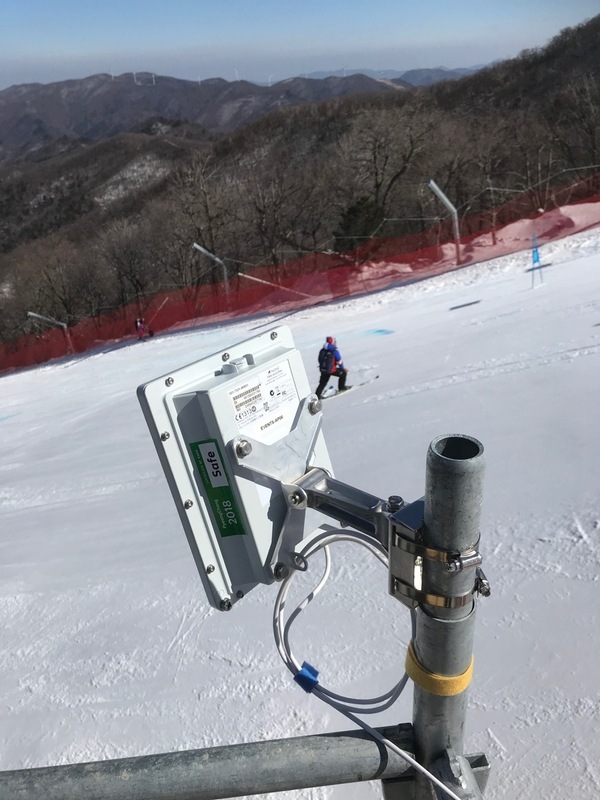 According to an anonymous “field scout” for Mobile Sports Report, there was solid cellular and Wi-Fi connectivity in place all around the PyeongChang Olympics, including slopeside at skiing events. Our scout, who spent a lot of time in the alpine competition area, said he had great connectivity wherever he went around the courses, even at places that weren’t special spectator areas. “There was never a point when I was on the mountain that I couldn’t make a FaceTime call,” said our scout, who is someone who knows well the issues of bringing connectivity to large sports venues. Our scout also said there was solid Wi-Fi connectivity on all PyeongChang buses for the Olympics, and that all other venues he visited (including the sliding venue) there was “rock-solid Wi-Fi” and/or speedy cellular to keep mobile devices connected. 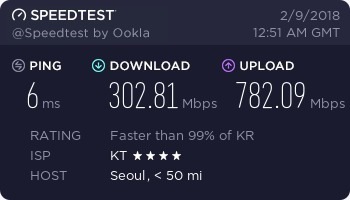 In telecom circles, it’s well known that South Korea has world-leading Internet connectivity in general, and a speedtest from one of our scout’s hotel rooms shows that without need for much further explanation. But the wireless connectivity at the Olympics seems to have been a priority, one that our scout found without a flaw except for one event — the closing ceremony. “In the stands [at the closing ceremony] I couldn’t get any connection at all,” our scout said. Perhaps the stadium’s black hole had something to do with the reported Internet attack at the opening ceremonies, which reportedly caused issues with the public Wi-Fi services. 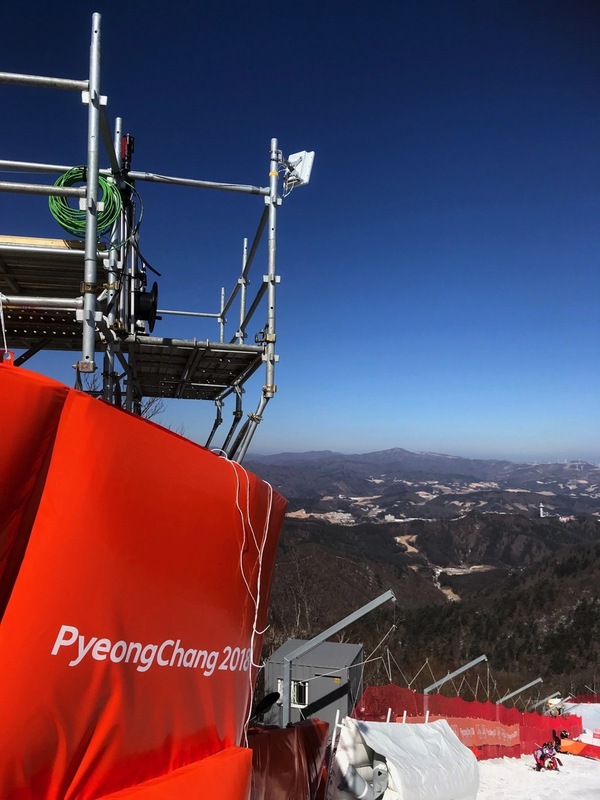 Korean telecom provider KT was the official telecommunications partner for the PyeongChang games, and according to various press releases we found online, it was partnering with Intel and the South Korean government to test some so-called “5G” deployments at the games. But so far we haven’t seen or heard of any other real-world experiences with the wireless connectivity there, so if there are any other “field scouts” who have stories to add, let us know! 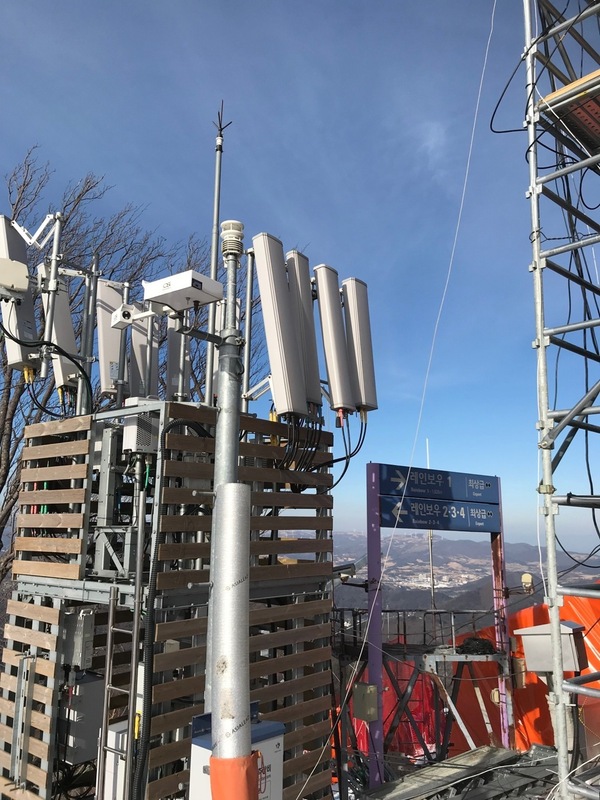 Cell tower gear on ski slopes at PyeongChang games. More Wi-Fi gear spotted atop ski course infrastructure.